Spektr, a Russian module to dock with the Mir space station complex, was launched from the Baykonur Cosmodrome by a Proton-K rocket. Spektr was originally built as a military surveillance module under project Oktant, but with the end of the cold war, this project was shelved. The nearly comleted Spektr module was converted then to a scientific research module. 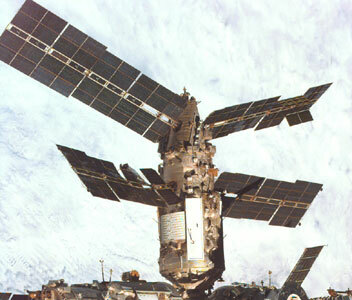 The 23.5 ton spacecraft was to remain with Mir for at least 3 years, but, like all modules remained at the station until the deorbiting of the complex. It carries a Belgian grating spectrometer MIRAS that will monitor atmospheric gases such as ozone, carbon dioxide, freon and sulfur. It also carried some American equipment to implement the Mir-Shuttle rendezvous beginning in late 1995. Spektr was heavily damaged, when the departing Progress-M 34 transporter collided with the module 25.06.1997. After that event, Spektr was no longer hermetically sealed and was no longer usable. Later, the electricity generated by the module, could agian be used for the Mir complex, when a special hatch was installed which featured power-cable interfaces.